I’ve been seeing Dr. Burns for about a year now. I started seeing her because I needed chelation, or detox with glutathione IV’s. I’m a huge fan of detox and the health benefits that come from cleaning the body out. I know that Dr. Burns previously worked in a medspa before opening her practice and offers medspa services like Botox, but I hadn’t thought much about them. I’ve been aging gracefully. Sure, I have a few small wrinkles, but nothing major. One day Dr. Burns mentioned that she was adding microneedling to her services and that I was a good candidate for microneedling. I figured it couldn’t hurt. I’m aging gracefully- but it couldn’t hurt to give it a try. 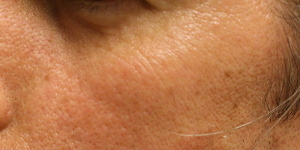 Most of my wrinkles are on my forehead along with crows feet around the eyes. That red circle on the right is a scar. The red circle on the left is a long wrinkle. When I first went in for the treatment, I started out having a sterile numbing cream put on my face. This cream was on my face for about 15-20 minutes. 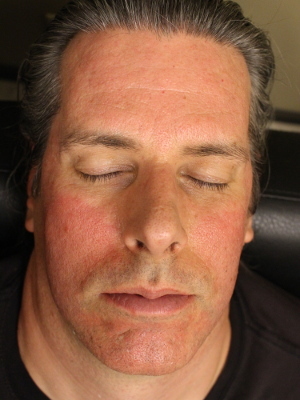 After my skin was numbed, it was ready for microneedling. 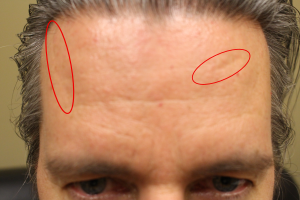 Before an area is microneedled, I had a hyaluronic acid solution is spread across my face. Dr. Burns explained that she could also combine PRP with the hyaluronic solution to increase healing. Stem cells are also an option. When the microneedling wand went over my face, it felt like a bunch of small pinpricks quickly going across the skin as it moves. I could feel the prickling of needles, but it wasn’t too bad. Overall, I think my whole face was done in 15-20 minutes. When the procedure was done, the areas that had been needled looked like they had a mild sunburn. It felt like a mild sunburn, and the skin felt dry. Other than feeling dry, the skin felt invigorated. It felt alive. 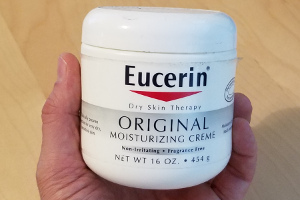 I used Eucerine moisturizing cream because I had some on hand when I got home. 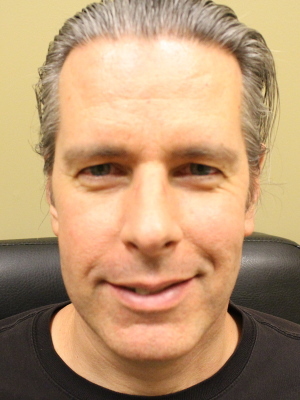 Dr. Burns has other lotions that are better suited if you mix PRP or stem cells in with the treatment. In my case, the Eucerine seems to work just fine. By evening, the redness had faded. The skin still looked a little tender, but it was a mild or light red, slightly noticeable.